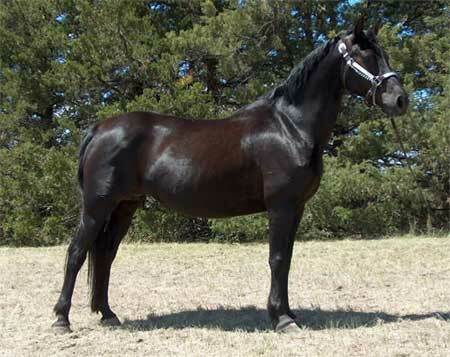 Cafalillie is sired by Funquest Cafallero. Harvey wanted to purchase Funquest Cafallero, but when he arrived at Stuart Hazard's he had already sold. Harvey purchased Funquest Cafallero at the age of 17, still wanting the Funquest influence in our breeding program. Cafalillie is an example of quiet mannered, gentle disposition horses that we breed for. She is broke to ride and is Harvey's favorite carriage horse. She is the dam of RG Rimlo Annie Black.